WHICH HOLIDAY IS RIGHT FOR ME? Home/TRAIL RIDES/WHICH HOLIDAY IS RIGHT FOR ME? Do you want a multi-centre, adventure holiday, that will show you not only the “real Spain” but give you the time to really connect with your horse and appreciate the splendour of the Sierra Nevada and it’s cultural heritage. These are “once in a life-time” trips you will never forget! 8 days – 7 nights, 1,600 to 3,000 metres, June-July. 8 days – 7 nights, 1,600 to 3,000 metres, June. Centuries old bridle paths and more recent forestry tracks take us daily from whitewashed mountain village to village. Alpine Summer pastures, mountain streams, ancient Moorish water channels, terraced small holdings and abandoned mountain farms, provide a window into another way of life. These short breaks are designed to pack in as much as possible in a shorter time. That doesn’t mean that we have skimped on anything! In fact you get more! Choose a holiday that gives you flexibility to take in the Cultural sites, like the magnificent Alhambra in Granada, as well as a great riding holiday. 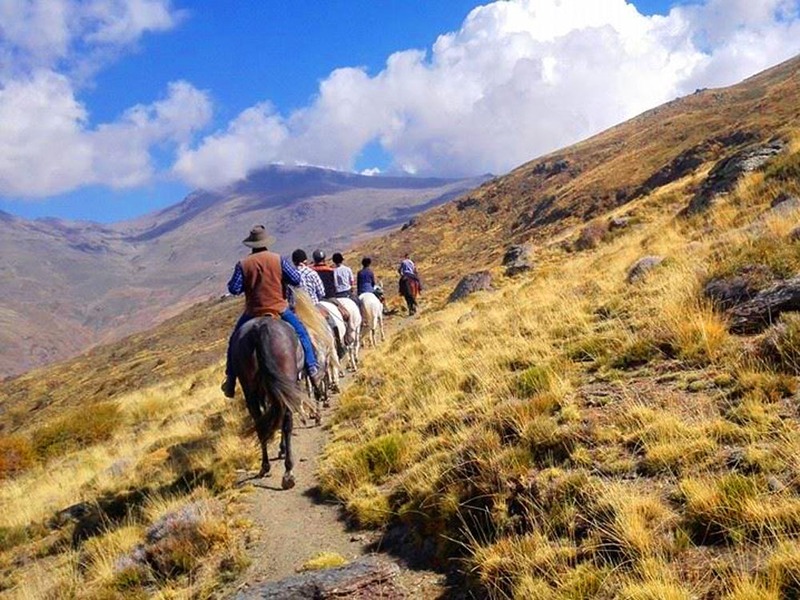 7 days – 6 nights, Combine riding, sightseeing and siesta.. The first day we ride through the spectacular Poqueira valley returning to the charming village of Bubion for the night. Second day we follow small bridle paths and forestry tracks to overnight in the village of Trevelez . Day 3 returning via the Sulayr path high in the National Park. 5 days – 4 nights, 1,600 to 2,500 metres, April to November. 5 days – 4nights, 1,600 to 2,500 metres, April to November.